In yesterday’s post, I shared about a Classroom Management strategy that I used in my Abecedarians class last year. When I first began as a Classical Conversations Tutor, the necessity of having a plan for Classroom Management was no where on my radar screen! Isn’t that hilarious?!?! I had, literally, given it no thought! The GREAT news is that, in general, I have had minimal, minimal, minimal issues arise in my class during my 2 years of tutoring. However, I am thankful to now have a strategy for managing my class. 1) What are my classroom rules? 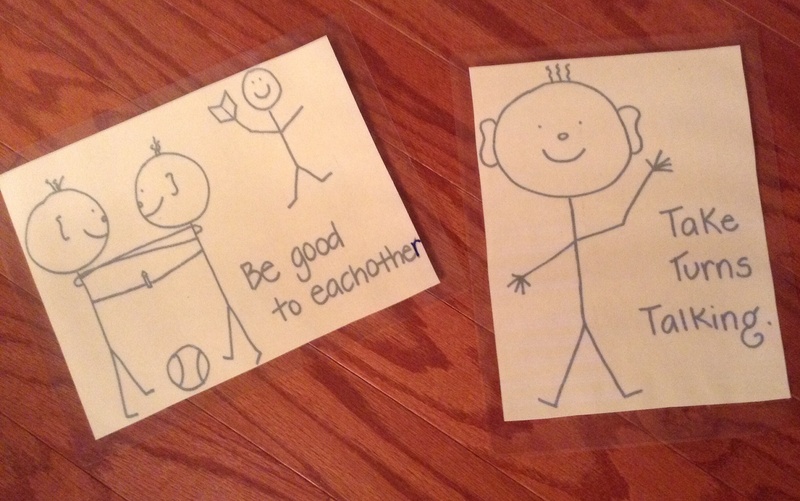 In yesterday’s post, I mentioned the 2 rules that I use in my class. They are shown in the picture above. Obviously, this is not an exhaustive list! 🙂 As you think about your class, think through what your expectations are for and of them. Make a list of those expectations and formulate those into rules. My personal opinion is “less is more.” Having 15 rules to remember might be taxing for a kiddo, but they could easily memorize three or four. 🙂 Make them memorable, use alliteration or use a familiar tune to make them “singable.” Present your classroom rules to your children on the first day of class. No matter what rules you decide to employ, know that you’ll need some. This will make your classroom more peaceful and will create an environment where children are ripe to learn! 2) How will you enforce them? “Enforce” sounds so mean and heavy-handed, but you know what I mean! This was where I failed miserably my first year. I shared my 2 classroom rules with my Abecedarians, but I had no plan of action in the event that a rule was broken. I shared my Mr. Stoplight yesterday (download him free) . That is one option to aid and encourage a peaceful classroom, but there are a multitude of others. Just don’t make the same mistake I did and walk into your class the first day with no plan. 🙂 Poll the veteran tutors from your community. Glean their wisdom about how they enforce rules and expectations in class. If behavioral problems arise in your class this year, remember the Biblical model found in Matthew 18: 15-17. Talk privately with the parent and make a plan together. If the problem recurs, talk with your Director. I know that confrontation scares most people, me included, so I try not to think of it as “confrontation.” I try to think of it in terms of a conversation with a parent of a child I love dearly. I usually walk into the conversation, not with guns blazing, but in a very dialectical way, I ask lots of questions. I also try to listen a lot, give grace, and remind the parent that I love this child and desire to partner with him/her to help the child in any way possible. When the parent sees and senses that you are FOR his/her son or daughter, the necessary conversation usually flows into a positive, helpful discussion. I pray that you have a wonderful CC year as you prepare now for ways to manage your classroom! 🙂 Seasoned Tutors, what other advice would you offer regarding classroom management? Thanks for sharing this. I think it is also very useful for all homeschool mamas in our homes as we establish order and behavior in our “school.” My first year of homeschooling started terrible with lots of complaining and refusals. A seasoned mama asked me, “Did you tell them that is against the rules?” LIGHT-BULB! We came up with a few rules as a family and posted them. We have a “traffic-light-of-sorts” (weather chart that their colored lady-bug moves on) and good behavior earns a sticker on a chart that has a fun prize. It worked like a charm…. Thank you for sharing this. I will share with my tutors. I wish I knew about your blog last year because we really needed this information. We loved being in your class, Suzanne, and I use your classroom rules in our home. We talk ALL the time about serving one another!